The Dragons are Division 2 Super Bowl champions. Amazing season. Listen, I love KP as much as you guys, but their uniforms look like a failed Color Rush experiment from the Jacksonville Jaguars. End 4th Quarter: 0-0. Reading will have 4th and 1 at KP 19 when we resume. 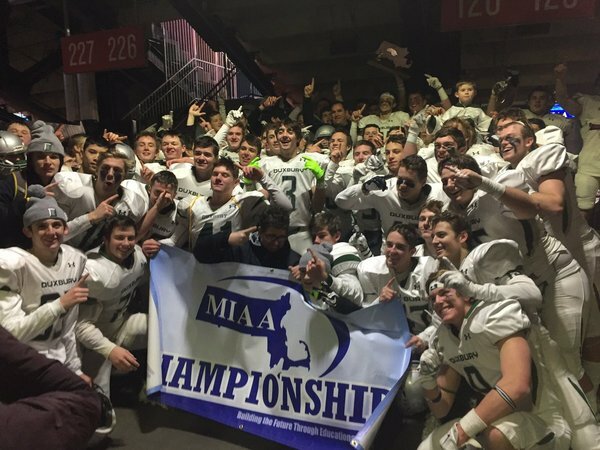 Duxbury senior Sean Lema: "I just remember coming to see the 2010 and 2011 teams. This is all I’ve wanted since then. It’s just amazing." Dave Maimaron on Bobby Maimaron: "I’m so proud of him. To do this with your son is a whole other level of elation." 3:01 2Q, Reading 6-0. 2-pt rush fails. Reading gets first sack of night. Anthony D'Avolio leaves LT in the turf with a straight push-pull. KP lands on fumble, they're gonna call it ruled down on contact. Replay shows clearly NOT EVEN CLOSE. That is the worst call I've seen today. Clear fumble, bright as day. Brutal way to end the half. 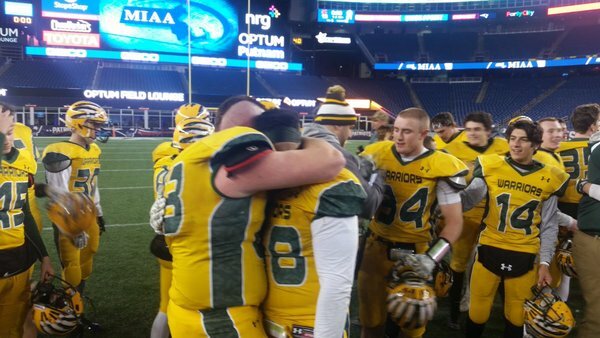 Half: King Philip 7, Reading 6. Best game we've seen so far today. Dave Maimaron: "Our goal is to win at Gillette. To make that happen is a storybook ending for this group of seniors." 4th and 1 from the Reading 2, and Lydon sneaks it for a TD. Mighta caught Reading off guard, didn't huddle -- went right to the ball. I don't know if the cadence was silent or first sound, but that's excellent coaching by KP on that hurry-up TD sneak. DiLoreto under duress flicks one to DiNapoli, who scampers for 26. 1-10 at own 46 for Reading. You can't make this up. KP dials up Spider Y 2 Banana for 69 yards, Mazur slips behind the safety and leaves CB in dust for TD. What a call. Brian Lee and John Fiore are throwing all chips to the middle of the table. Everything but the kitchen sink in the 2nd half. This is fun. KP offensive coordinator and ESPNBostonHS alum John Sarianides @xnojoe calling the game of his life tonight. Bobby Maimaron: "It’s unbelievable. I can’t describe it. It’s the culmination of all our hard work, and it paid off." Your MIAA Division 1A State Champions. Hokies we can't give that up.